Claire Bennett (Jenifer Aniston; Friends, Horrible Bosses) is in a lot of pain. Continual, excruciating pain. Physical pain, mental pain and, most importantly, emotional pain. She doesn't know how to stop the pain; or rather she does, but can't get enough determination together to end her life so she teeters between living a hollow existence or killing herself. And there in a nutshell is the synopsis of Cake, out now on Blu-ray and DVD. However, this movie is so much more than that. It's a commentary of loss and forgiveness and moving on with life when there doesn't seem to be anything to motivate someone to move forward. It's also a sad tale of living in limbo, unsure of what comes next and how to embrace life or run from it as fast as possible. Claire attends a chronic pain support group but clearly has no interest in "healing" herself. When one of the other members commits suicide, Claire becomes fascinated by her death. She starts delving into Nina's (Anna Kendrick; Pitch Perfect) life, only to become entangled with Nina's husband, Roy (Sam Worthington, Avatar), and son, Casey (Evan O'Toole, Wild). She also starts talking with Nina via drug-addled hallucinations. Having pushed everyone away – her husband, her housekeeper - Claire oddly seeks out Roy and Casey to unknowingly help her find answers for her despair. Without her realizing it, they are the catalyst and unconsciously help her decide to live, put effort into becoming physically and emotionally healthy and rejoining the world. Aniston is brilliant in this film. There is simply no other way to say it. When we meet Claire she is angry but hurting, sullen and despondent. Aniston makes us feel every emotion with sharp clarity. As we watch Claire's journey we can see Aniston soften but resist the change. She brings us along with her via every emotion known to man and that is what makes this film work. Kendrick, Worthington and Adrianna Barraza (Thor) all compliment Aniston beautifully and give nuanced performances that help us understand the various factors at play for all of them. As with most Blu-rays, The 1080p video is clear even when Director Daniel Barnz (Beastly) purposely makes the scenes out of focus and hazy. The DTS-HD Master Audio 5.1 is what you would expect and really showcases the wind chimes that ring throughout the film. The subtle highs are like a musical triangle meant to wake us up. There are a few extras that are interesting enough to watch but left me wanting more. I would have liked them to explore the chronic pain issue further and I would have liked to meet more of the cast other than Aniston in the "meet the Cast" feature. For a film discussing such heavy subject matter, Cake doesn't seem to wear the viewer down. On the contrary it begs us to question and explore and hopefully come out the other side more complete than when we began. Download Cake from the iTunes Store in Digial HD. 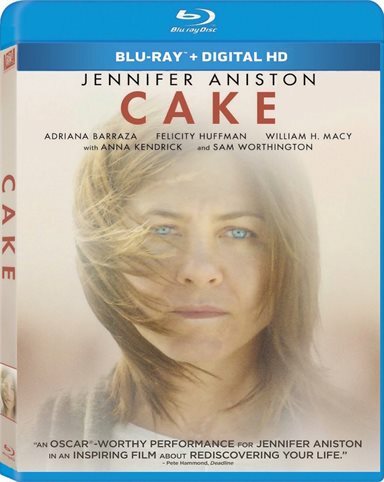 For more information about Cake visit the FlickDirect Movie Database.